In April of 1890, the École des Beaux-Arts (School of Fine Arts) in Paris showcased an exhibition of Japanese woodblock prints. 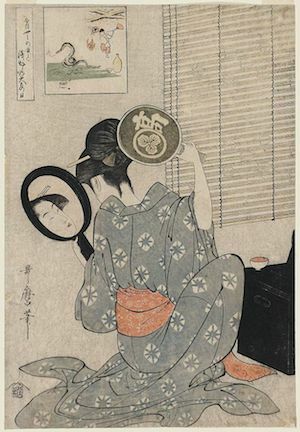 These ukiyo-e images, “pictures of the floating world,” as they were evocatively called, were comprised mostly of scenes of urban bourgeois pleasure—geishas, beautiful women, sumo wrestlers, kabuki actors—and pictures of the natural beauty around Edo (present day Tokyo)—the mists of Mount Fuji, cherry blossoms, rain showers, and surging waves along the port of Kanagawa. Ever since Commodore Matthew C. Perry helped to open imperial Japan to Western trade in 1853, Europe had become fascinated with Japanese culture. Artists like Edgar Degas, Camille Pissaro, Claude Monet (recall Monet’s Japanese bridge in his gardens at his estate in Giverny), Vincent van Gogh, and James Abbott McNeill Whistler, were among the many who incorporated elements of Japanese design into their work. Some of them also frequented the bustling antique shop on the Rue de Rivoli, La Porte Chinoise, that specialized in Japanese woodblock prints, jades, lacquers, and porcelains. The craze of Japonisme went to such heights that in 1885, the English opera team of W.S. Gilbert and Arthur Sullivan staged their most popular show, a comic opera set entirely in imperial Japan, The Mikado. This drypoint etching, The Coiffure, of a woman adjusting her hair is one of the hundreds that Mary Cassatt made in her in-home studio in the summer and fall of 1890 and in the winter of 1891. 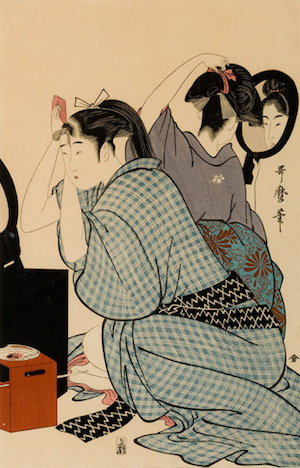 It was inspired in part by a woodblock print in her personal collection, Kitagawa Utamaro’s boudoir image of the daughter of a prosperous Edo businessman, Takashima Ohisa Using Two Mirrors to Observe Her Coiffure (above). La Coiffure also has its art historical roots in Old Master paintings of women bathing and the odalisque though it departs from those conventional models to become a tightly crafted exercise in form and composition. 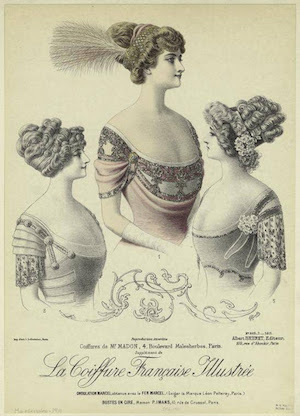 The word “la coiffure” evokes a precise image, one of wealthy women in glamorous settings. The ritual of grooming, dressing, and preparing one’s hair from the seventeenth and eighteenth century court days of Anne of Austria and Marie Antoinette was passed down to nineteenth-century ideals of femininity and beauty. To wear an elaborate hairstyle such as those depicted in this magazine illustration by George Girard, one needed to have a maid to help with one’s hair. “La coiffure” was part of a specific lifestyle. Yet the woman in Cassatt’s print is tending to her hair alone. Perhaps what we are seeing is a working woman getting ready to start her day. The counterpoint of the print’s title and the reality of its subject matter characterizes the ironic tension within the image. 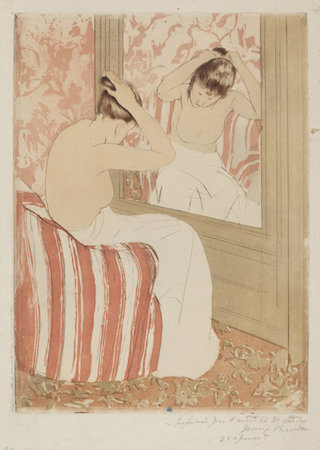 The woman in Cassatt’s La Coiffure sits in a plush armchair in front of mirror, her head focused downward, her back arched, as she adjusts her bun. The voyeuristic element to the scene is drawn from precedents in works by Rembrandt (Bathsheba at Her Bath, 1654) and Ingres (La Grand Odalisque, 1814), which Cassatt studied at the Louvre when she was a young student in the mid 1860s. The woman in La Coiffure, unlike Rembrandt’s Bathsheba or Ingres’ Odalisque, is not sexualized. Though her breasts are exposed, her chest and the details of her body are deliberately muted into an overall structure of curves and crisp lines. This is an exercise in clarity and tone where the subject, the woman’s body, is a compositional element in the picture—as vividly realized as the other significant patterns of the room—the wallpaper, the fabric of the armchair, and the carpet. The curve of the woman’s sloping back and neck echoes the curves of the chair which stand in contrast to the vertical lines of the mirror—a compositional counterpoint that further enhances the tension within the tight composition. The limited color palette of shades of rose, brown, and white, enables us to focus closely on the form and clarity of line. 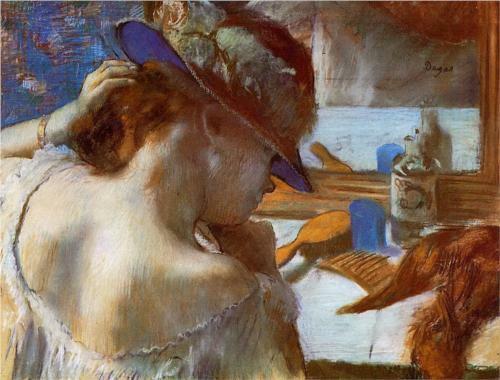 It also mimics the quality of pastels, which Cassatt, like her friend Edgar Degas, often liked to use. Through the process of the drypoint and aquatint etching, La Coiffure combines Cassatt’s propensity for hazy shading and soft tones with a bold sharpness in line allowing the artist to integrate the qualities of two disparate media. Her desire to emulate the haziness, sensual, and suggestive possibilities of pastels is what motivated Cassatt not to use woodblock printing but intaglio. First, Cassatt carved her designs onto a smooth copper plate with a fine metal needle. Then the plate would be dusted with a powdered resin and heated until the resin melted in tiny mounds that hardened as they cooled. Acid was then added on to the metal plate biting the channels along the resin droplets. The deeper penetration of acid produced richer, darker tones, while a lighter application of acid produced lighter shades of color and a variety of nuanced gradients could be generated within a single print. Once Cassatt had replicated a certain number of images from a plate, she would incise the plate with a needle so that no one could use the same image again. The companion piece to La Coiffure is Woman Bathing, another image of a woman, bare-chested and half-dressed, grooming before a mirror. 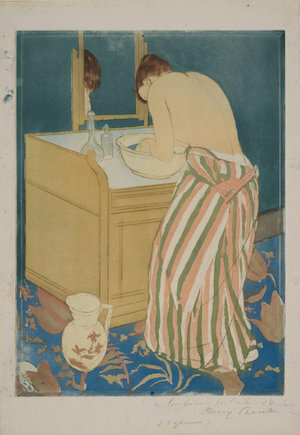 Cassatt was inspired in part by some of Degas’ pastels of women grooming. In Cassatt’s prints, the time-honored boudoir scenes we see in Titian and Bellini become de-eroticized and re-appropriated as skilled exercises in form, shading, and line. In the spirit of ukiyo-e and Impressionism, these prints capture fugitive, fleeting moments of the busy lives of the Parisian bourgeois and working class. This philosophy of art for the masses wasn’t always popular with Mary Cassatt’s contemporaries, like John Singer Sargent and the art historian Vernon Lee (Violet Paget), who viewed Cassatt’s printmaking as a dilution of her precious talent. Yet Cassatt understood that as the world was changing with the twentieth century’s new industries and technology, more and more people would have the income, education, and ability to experience art in ways they hadn’t been able to before. The proliferative possibilities of the print and its evocative potential to convey so much in such a small space was just the art form to reach a wider audience. As quoted in Nancy Mowll Mathews, Mary Cassatt: A Life, Yale University Press, 1998, p. 234. Cite this page as: Farisa Khalid, "Mary Cassatt, The Coiffure," in Smarthistory, August 9, 2015, accessed April 19, 2019, https://smarthistory.org/cassatt-the-coiffure/.